A recent MediaPost op-ed by Anudit Vikram, SVP of Audience Solutions for Dun & Bradstreet, highlights an area that has been receiving growing attention from TAG’s leadership team and members over recent months: namely, how TAG’s efforts can successfully help companies protect and strengthen the safety of their brands. The advertising industry needs to adopt a series of strategies which help combat fraud and ensure digital advertising is both legitimate and brand safe. Not only does online advertising fraud represent a deadweight loss to advertisers, but it can result in brand harm when advertising is placed next to objectionable content or malvertising. In a recent study, nearly 70% of respondents said brand safety has become more important to their businesses. With programmatic marketing, advertisers are looking to ensure that ads will be displayed on brand safe networks, not “fake news” sites with fringe or hateful content. TAG provides an industry “white pages” for advertisers, helping authenticate over 200 advertising companies across 20 countries. While TAG offers a whitelisting mechanism, another strategy for reducing advertising fraud is referencing IP address blacklists which block advertising revenue from being directed to criminals. TAG has also developed a fraudulent traffic list of 65 million IP addresses sourced from 12 to 15 major ad platforms each month. This blacklist allows the industry to collectively fight fraud through shared intelligence. Know a Compliance Rock Star? TAG Is Hiring! Do you know any compliance experts who want to help solve the big problems facing the digital advertising ecosystem? Let us know! TAG is hiring a new Director of Compliance to oversee all aspects of TAG member compliance with each of the four TAG certification programs, including the Certified Against Fraud, Certified Against Malware, Certified Against Piracy, and Inventory Quality Guidelines seals. Reporting to TAG’s COO/SVP of Operations & Public Policy, this new position will serve as the subject matter expert on the content of all TAG certification standards. The person will also work collaboratively with the TAG Director of Programs & Policy to ensure that TAG’s Working Groups update the certification standards and compliance tools to address changes in industry best practice and technological capabilities. For more information about the position or to submit any recommendations on potential candidates, please contact rachel@tagtoday.net. TAG executives will be taking part in the following events in May. If you’re attending too, let us know. Hope to see you there! Even as the online video ad market becomes a highly mature industry, the topic of brand safety continues to raise its ugly head. In Asia, where the digital video audience is vast (almost 1 billion eyeballs), the story is no different -- the actions of a few give the rest a bad name. But there are ways for publishers and advertisers to safeguard themselves against this bad behaviour and help make issues like fraud, unverified impressions or illicit content a thing of the past. 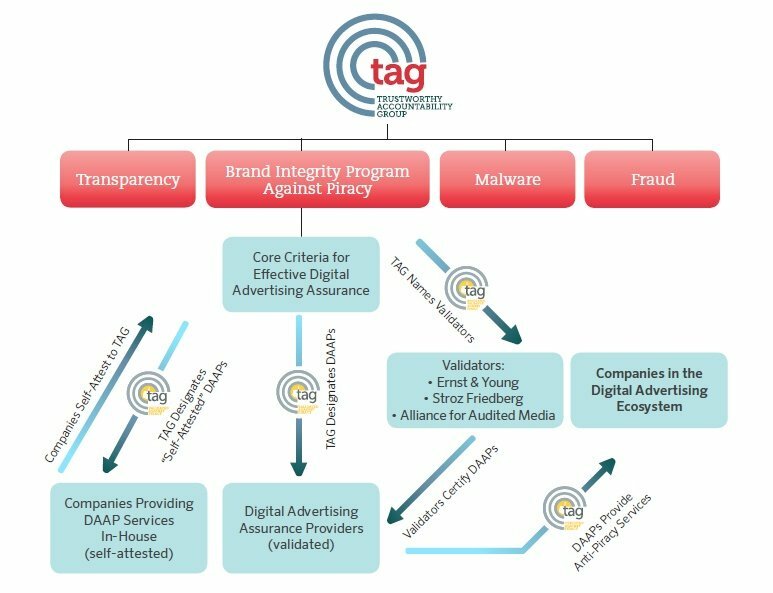 TAG is a first-of-its-kind, cross-industry accountability program designed to eliminate fraudulent traffic, combat malware, prevent internet piracy, and promote greater transparency across the digital advertising supply chain. Google's dominance among advertisers means it is a critical player in helping brands reorient around the customer journey. Google's Allan Thygesen appeared at Monday's 4As' Accelerate Conference to outline how his company is committed to working with agencies to build and strengthen an advertising ecosystem that works for agencies, brands and consumers. "At times, Google has fallen short," he admitted. "Underlying this belief is that healthy ad ecosystem must be transparent, trustworthy and valuable." In addition, Google is working with the Interactive Advertising Bureau (IAB) and the Trustworthy Accountability Group (TAG) to develop invalid traffic policies. We love it when TAG members highlight our work together to fight digital ad crime and improve transparency. Please send any TAG-related press releases, blogs, or other announcements to Andrew Weinstein at andrewwstn@gmail.com for review before release.